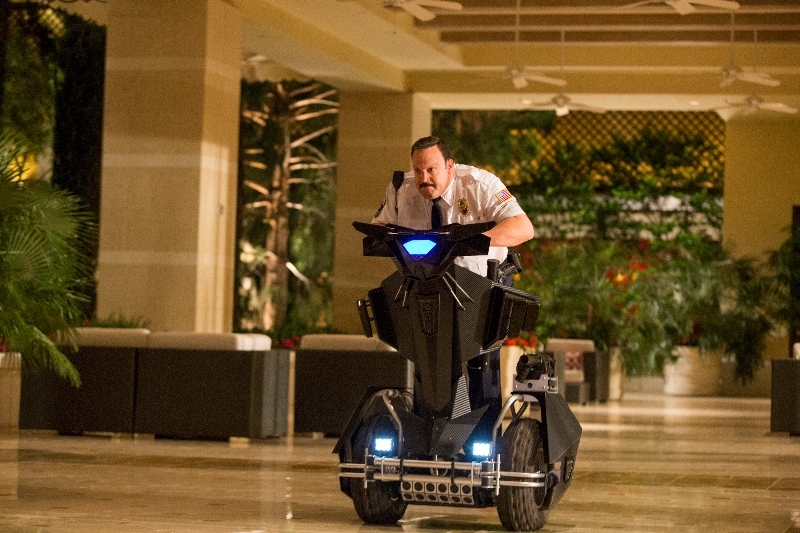 Paul Blart: Mall Cop 2 Review - Are You Screening? 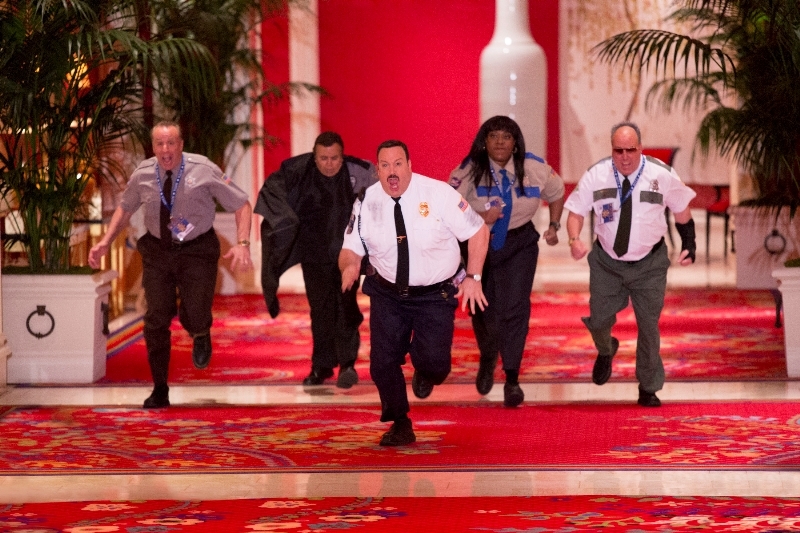 The thing to know going into Paul Blart: Mall Cop 2 is that it isn’t a real movie. No one involved in the film thinks it has any positive qualities at all, much less that there is anything funny in it. It’s just one more step in the Kevin James, Adam Sandler, Happy Madison Productions endeavor to follow in the footsteps of P.T. Barnum. It isn’t a film created because anyone thinks there is any “goodness” about it (using any definition you want), it’s a film created because several people think lots of other people are stupid. With a roughly $30 million budget, it’s going to pay off. Kevin James is back for another trip on the Segway with a character no one asked for more of. Now several years later, Paul Blart gets invited to SecurityCon, or whatever, in Las Vegas, and he decides to take his daughter, Maya (Raini Rodriguez), for a last trip before she goes away to college. The film is quick to sell Blart’s overprotective attitude toward his daughter, who has to carry a briefcase-load of security products to go the hotel’s pool, and it’s an early establishment of the kind of picture we’ve got coming. It’s construction based on the idea that Scooby Doo works well enough, which is insulting to Scooby Doo, even to the extent that Kevin James “hides” by tip-toeing behind things he’s bigger than, and the bad guy actually points out that he has two different colored eyes. The plot revolves around Neal McDonough, and his plot to steal art from the Wynn resort, because Steve Wynn was willing to throw a couple million at the movie if he got to be in it, and feature his hotel… one must assume. Tangential efforts include Blart’s meeting with the Security big wigs, and the gorgeous hotel manager (Daniella Alonso) who falls in love with Blart. Among the security conference members is Kevin James’ brother, Gary Valentine, who plays a laughless shnook who has his arm meaninglessly in a cast. You have to guess that Valentine was just actually in a cast during filming, because, who cares? As the movie rolls along, and keep in mind that nothing funny happens, the scenes that move the action are almost winking at you, daring you to keep playing along, and mocking you for doing so. Worst of all, in situations like the kidnapping of Blart’s daughter, or the disruption of the theft, the movie doesn’t even have enough faith in your mental prowess to just show you what’s going on, it has to have the character’s explain it to you as well. You might imagine that this is all a matter of misplaced analysis of something that is aiming at an audience between the ages of 9 and 13, after all, I mentioned Scooby Doo, but even if you could attempt that lens, it still doesn’t sidestep thinking its audience is stupid. Which says little about what adults it believes are showing up. Everything that’s ever been on any of the various Disney and Nick channels has had more respect for its audience, and immeasurably more funny. Like virtually every movie associated with Happy Madison, this is just a working vacation a select group of actors get to take while they laugh at all the idiots who are footing the bill. In a different world, this would be a career-killer, but similarly laughable efforts before haven’t seemed to hurt anyone’s ability to keep popping up in things. Using a Flickchart theory of movie ranking, it turns out that this is the worst movie I’ve ever seen, because I would watch absolutely anything before watching this again.